La Lidia January 1945. Carols Arruza Triunfador en Mexico, en Puebla. En Espana Y Donde Actua. Unico Competidor Cexicana de canuel Rodriguez Ma Nolete, Foto by Mari. On Cover. Articles inside include Enorme Toro de San, Por Francisco Montes, Pepe Luis Vazquez, Cargando La Suerte Por Alberto Lazaro, La Historia No Es Un Cuento, Toro, Medio Toro Y Estilismo, Las Escuelas Del Toreo and more. Filled with great illustrations of Bullfighting and Bullfighters and period advertising. Magazine is complete and in good condition, wear and small tear at edges, light water stain at lower edge. 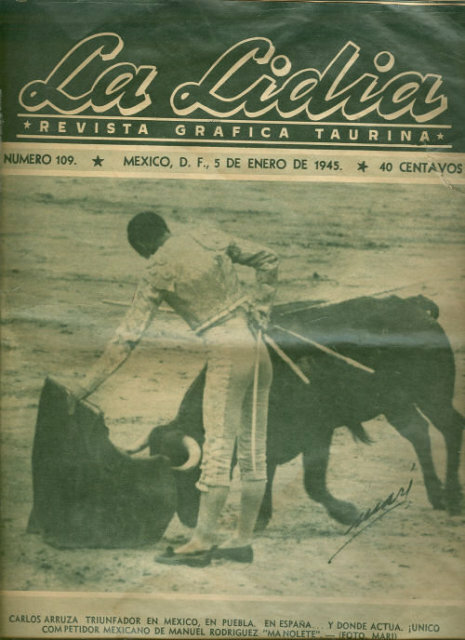 Items Similar To "La Lidia January 1945 Mexican Bullfighting Magazine"